﻿This past weekend was a treat for any self respecting wine lover and I am told the Wacky Wine Weekend in Robertson was a great success…once again! However on Sunday afternoon saw the first ever Burgundy Lovers Festival, hosted by Wine Concepts at The Vineyard Hotel and Spa in Cape Town. 29 top producers of Chardonnay and Pinot Noir showcased their wines to visitors to the Festival. I spent most of the time tasting my way through the Pinot Noirs and was impressed by the overall high quality. Pinot Noir is known as “The Heartbreak Grape” due to its stubbornness when planted outside of its native country France! Locally grown the grape can cause two problems for the winemaker, one that the grape fails to ripen sufficiently in cooler climates which results in thin wines and secondly in hot climates it easily overipens which results in a wine with course jammy flavours! If managed correctly Pinot Noir offers an elegant style of wine with its pale red colour and delicious array of fruit flavours. When young the wine has perfumed aromas and flavours of fresh raspberries, strawberries and red cherry and as it ages aromas of truffles, game, and well hung meat come to mind! With its high acidity and low tannin structure it is an ideal partner for foods with high acid. I have often enjoyed this variety with dishes that normally partner white wine such as fish and chicken! Tasting through the line up at the Festival it was clear that the winemakers have overcome their problems with this variety and many favourites were discovered on the afternoon. But as often happens there is always one that stands out! The wine I went back to taste was The Oak Valley Pinot Noir 2009. It was, in fact, the second time in a matter of days that I had tasted and enjoyed this wine. The first time was over a delicious lunch of antipasto prepared by Nikki Booth from Ottimo Cibo. Oak Valley Estate is well known for its apple and pear orchards and for their greenhouse cut flower production (Oak Valley Flowers, are the largest supplier of fresh cut flowers in the Western Cape) and more recently for their award winning wines. Although the estate already had a few old vineyards it was decided to uproot and replace them. 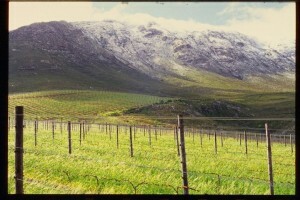 New vineyards were planted by the present owner, Anthony Rawbone-Viljoen in 1985. The Elgin climate is cool and lends well to the production of wine which has seen some of the countries foremost wine makers snapping up farms in the area. The grapes from Anthony’s new vineyards were initially sold off to a few select wineries and it was only in 2003 that Oak Valley produced the first wine under their own label. Winemaker Pieter Visser believes the 2009 Pinot Noir is his best yet and I tend to agree. The wine in the glass has a delicate pale velvet hue with upfront aromas of fresh strawberries and rose petals. Silky elegance best describes the palate with its rich flavours of red cherry and clever balance of acid and tannin. Lovely to enjoy now either on its own or with food, but the wine has the complexity to mature into something even greater after another 5 years.